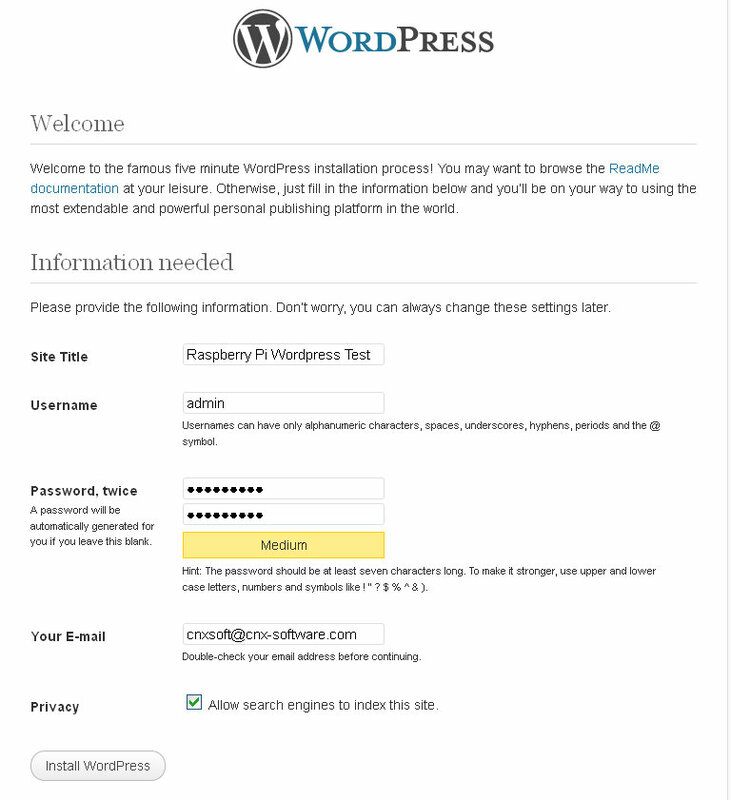 I’ve been wondering how the Raspberry Pi would handle WordPress. I’ve found some instructions using Apache 2, but this may not be the best server to use for this type of low-end hardware. nginx server requires less resources, and as it is what I already setup for this blog, I decided to give it a try on the Pi. I’ll provide all the detailed steps I followed below, but you can also download the compressed SD card image (113 MB), uncompress it and copy it to an SD card the usual way. After the system boots, find your Raspberry Pi’s IP address, type it in your PC’s browser, and you should see the page pictured below. If you want to login to the dashboard, the username is “admin” and the password “raspberry”. You can use your default Debian Linux distribution (e.g. Raspbian) if space if not an issue, but all what I did below is based on Raspbian minimal image. You’ll be asked for mysql root password. I used “raspberry” of course! sudo mkdir -p /srv/www/wordpress/logs/ sudo mkdir -p /srv/www/wordpress/public_html cd /srv/www/wordpress/public_html sudo wget http://wordpress.org/latest.tar.gz sudo tar xzvf latest.tar.gz sudo mv wordpress/* . Welcome to the MySQL monitor. Commands end with&nbsp;; or \g. Finally change the directory permissions and start(or restart) nginx and php5-fpm. Where you need to replace 192.168.0.106 with your Raspberry Pi IP address. Fill the details (I used “raspberry” password), click on Install WordPress, and follow the installation instructions in your browser. You should now be able to login to the Dashboard and create a post. For better performance, I’ve installed W3 Total Cache plugin, and enabled Page, Browser and Object caching. Once caching is enabled, the pages should load immediately (less than a second) for non-logged in users. I did experience one issue with caching enabled but not working. This was solved by clearing my browser cookies. Go figure. Since the dashboard is not cached, editing posts and adding pictures is somewhat slow but still usable. With this simple WordPress page, the Raspberry Pi can handle 3.44 Requests per second, which is equivalent to around 12,400 requests per hour or nearly 300,000 requests per day. You might want to try to further improve performance by using PHP APC and Varnish, or replacing MySQL with SQLite3. If you tried to make this guide as simple as possible, should’ve used wordpress is packaged in debian, http://packages.debian.org/wheezy/wordpress, simply apt-get install wordpress. Thanks. I did not know WordPress was available as a package. Puppy Linux has PPLOG, which is a single Perl script, that uses it’s own plain-text filing system (no database required). This is also in the Puppy port for the Raspberry Pi, but I haven’t actually got around to testing it. It is so tiny, most builds of Puppy have it. it is great as a personal blog, even if you don’t want to publish it on the Internet. they have similar thing for android also? I’m not sure if you meant to reply to myxa78, if not, see the first comment above. wordpress has a static cache plugin if i am not mistaken, that could improve the stats of the apache stress tool. I used W3 Total Cache, so this benchmark actually shows the performance to serve static pages. I followed you tutorial but it seems that my raspberry is almost ten times slower than yours! Look at my benchmark with only 10 requests. Any clue? Can you check caching is working, by verifying some files are created in wp-content/plugins/w3tc/pgcache or objcache directory? (Not sure exactly of the dir but should be similar). Thanks, I did not know apc could provide such a boost in performance… I should try it on this blog. In the SD image you provide the IP adress for wordpress is 192.168.0.106 and i want to modify it. Could you provide ssh access info ? Thanks for your installation description for nginx! as long as I access the blog within the same network everything is fine (response time ~2-3sec). When I try to access it over the internet (I changed WordPress/Settings/General/ home/site URL to my dyndns URL), responses are very slow />30 sec. DSL speed shouldn’t be the limiting factor – accessing a static html (that I placed in the public_html folder) over the internet was fast…. You should try to enable debugging in W3 Total Cache to see if caching really works. You could also try some web loading test tools such as http://www.webpagetest.org/, it could help you find out what is wrong. I did the test and the strange thing is: after the initial request there are several calls to the local/private IP of my raspberry PI which can’t (and shouldn’t) be resolved. I even added my dyndns to WP_HOME and WP_SITEURL in the wp-config.php. remark: There seems to be some problem with my router: I can’t connect to my dyndns URL from within the lan. But this shouldn’t be a problem when accessing the wordpress site from the outside, e.g. using the webpagetest. originally I had the private IP(http://192.168.2.10) configured as site-url and wp-home. Later on I did change them to my dyndns through the admin frontend. …the result showed that siteurl still contained the private IP. I.e. my config-entries were ignored! Finally I updated the db to use my dyndns url. Additionally I updated another table to adjust the previous content-uploads. The result: My page loads quite fast and without errors – next step: reactivate the cache! Thanks again for your tip regarding webpagetest. This helped a lot. this config file doesn’t work for me. using the one on the nginx site (example for wordpress sites) works fine. Found it, I’d made a change in the config but hadn’t cleared my browser cache! I tried your image and I am very impressed with it. Makes the RP very useable as a WordPress Server. However I had to use the same network configuration as you in order to access WordPress (ie 192.168.0.106). Which configuration file holds this setting? My educated guess is it is something in WordPress because the page starts to load using my network settings of 10.0.0.x but the address for WordPress auto changes to 192.168.0.106 and only loads a few text based items. Any help would be much appreciated. I guess WordPress uses the IP address during installation. I’m not exactly sure where it’s stored, or if it can be changed in the dashboard. The fast way could be to install it yourself. Thanks a lot for this guide! I now have my own website running on my Raspberry Pi (I just created the domain some hours ago so it’s not working yet, still waiting :)). Gents, you can manually define the site’s URL using the wp-config.php file in the root of the wordpress install. Then, add the following lines to your file, replacing the x’s with your pi’s URL. Lordy thanks Geoff! Where has this post been for the past year! WP has given me such headaches over IP changes! i followed this post to build my php environment, and it works with port 80. but now i want change the port to 8000.
i am fresh with pi and linux, even nginx. then i restart nginx and php5-fpm, and i got no iptables. but it not work,i cannot access my site with the http address. when i use command: telnet myip 8000, and type Ctrl+C, it shows me 400 bad request. What is the need of Nginx? Would you recommend running a wordpress site on a raspberry pi for online use? Nginx simply replaces Apache, as it is supposed to use less memory. My Raspberry Pi board had 256 MB RAM at the time. 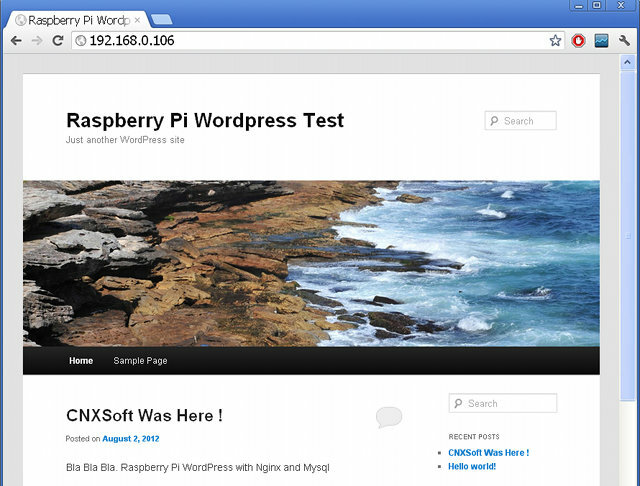 You can run WordPress site on a Raspberry Pi for online use as long as it does not get too many hits.